Discovered this HUD, works great! Thanks, jtarheel42! I'm glad you like it! - Current docked station was not being updated upon docking. - Added armour values (from IronHide or Ship Configuration) to the HUD. - Added a "docked station" label to the docked HUD. - Improvements to the hi-contrast mode, making MFD's more visible. - If you launch using another HUD, then use HUD selector to change to the Xenon HUD, the HUD should now be displayed correctly. - Trimmed some fat out of the equipment.plist file. - Crosshair red alert mode now only triggers in combat red alert. - Clock position on main display will now be more centred based on the font being used. Added a incoming missile warning indicator. Code improvements and better integration with HUD Selector. Fixed issue with mission screens that use the short range or long range special backgrounds and overirde the player's target system. The player's real destination was being reset if the player went from the mission screen displaying the map directly to the F6 screen. It now waits a moment to allow mission screens to do their own cleanup before checking and reseting the destination. Better handling of scenario in interstellar space when player selects their originating system as their jump destination. Destination will now appear in HUD. Sound effects added for mode/activate functions of HUD. Added very small crosshairs to appear when standard crosshairs are turned off during green or yellow conditions. Added flags into Library Config to disable the docking HUD and the missile warning indicator. Added flags into Library Config to manually set the crosshair mode, and to disable the Mode selector primable equipment item. Fixed issue with hyperspace destination system being linked to the space compass, and not considering the presence of the ANA. Your Xenon OXPs really are game-changers. Thanks for the good work! 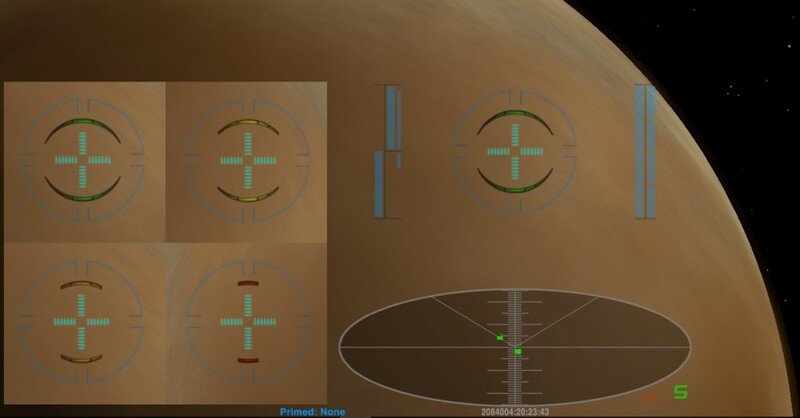 Small request: replace the status indicator (aka threat level indicator, the little circle between the bay/scoop dial and the scanner), which is not really useful, with a masslock indicator which would be more useful (mainly when you're near a planet, in order to know when you can use the Torus drive without spamming the J key). That's a great idea, Astrobe. I'll look at implementing that shortly. Actually, that small indicator between the fuel scoop and the scanner is the joystick precision indicator. I have it visible as sometimes, in the heat of battle, I would occasionally hit that button, so it's useful to know what mode the joystick is in. Added a mass-lock indicator to the HUD. Added flag into Library Config to disable the mass-lock indicator. Fixed Library Config default setting for missile warning indicator. - the masslock indicator seems to me a bit intrusive there, considered it is a minor function. Also, it is still displayed when the centre group is not (e.g. display crosshair only in red condition and condition is green). I'd like to move it somewhere below the scanner. - The method to determine the masslock state is a bit convoluted. There's a method that does this work for us (http://wiki.alioth.net/index.php/Oolite ... MassLocked). Wow! How did I miss that function! Thanks for that Astrobe. I'll do some more work on it this week. "submit" was perhaps the wrong word or a bit ambiguous. I meant I could (try to) make those changes. I was asking beforehand because it could be difficult to merge concurrent changes, and you might have objections against some of them. I'd be happy to get some changes from you! Play around, get it working and I'll look to include your changes into the main release. Thanks for the mass-lock indicator. Very handy.